Ontario “liquid wood” producer Ensyn Corp. is ramping up production of its renewable fuel oil and has put the welcome mat out to the forest industry, noting that its biofuel facilities—when attached to an existing sawmill—can help to improve the economics of a mill. A $30 million rebuild at EACOM’s sawmill in Timmins, Ontario, was a major undertaking for the company, but it’s expected to yield a production increase of as much as 20 per cent. Logging contractor Hec Clouthier & Sons harvests a wide assortment of logs in the areas they work in, in eastern Ontario. Typically they sell wood to 13 mills—but after a significant blowdown, they were able to sell wood into a staggering total of 38 mills. Both Quebec logging contractor Mario Gauthier and forestry co-op Forestra have adapted well to new regulations that amended the fibre allocation system in the province, thanks to Gauthier’s solid equipment and Forestra’s focus on developing fibre markets. 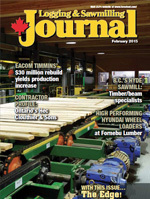 B.C.’s Hyde Sawmill has found a successful market niche producing high quality timber and beam products using three Wood-Mizer band saws, and a Mahoe circular saw from New Zealand. B.C. company WoodX offers a market intelligence data service to prospective timber buyers to help them make prudent and competitive bids in the BC Timber Sale program. Every efficient sawmill needs a fleet of high performing millyard wheel loaders and the Fornebu Lumber operation in New Brunswick is finding its Hyundai equipment —which includes the big daddy of the fleet, a Hyundai 770 with 300 horsepower—fits the bill very nicely. Included in The Edge, Canada’s leading publication on research in the forest industry, are stories from the Canadian Wood Fibre Centre and Alberta Innovates - Bio Solutions. The outlook for Canadian lumber producers over the next several years is positive—meanwhile, the outlook for Canadian pellet producers is positively rosy, says Jim Stirling. Modular off-site building construction is on the rise globally and particularly in Alberta, say industry experts. The method is well established in Alberta in both commercial and residential construction, with companies such as Landmark Building Solutions, Star Prebuilt Homes and others leading the way in the residential sector. The contracting company Cormode and Dickson, and developer Integrated Management & Realty, have also committed to off-site building construction. Construction giant PCL Construction recently created a new division and appointed a new vice-president for modular and off-site construction. Greater use of modular off-site construction (MOC) has the potential to significantly reduce the amount of time it takes to complete a project, while improving the overall quality of structures and generating much less waste. Building components, such as roof trusses, floor joists, staircasing, windows, doors or even walls are manufactured in an industrial plant and then transported to a construction site where crews assemble the components. It takes a fraction of the time to erect a building this way compared to what it typically takes to frame and erect a similar building using the traditional on-site, stick-built method. “In my opinion, modularization could be used in every type of building, but to different degrees,” says Dr. Mohamed Al-Hussein, professor of construction engineering and management in the Hole School of Construction Engineering, Department of Civil and Environmental Engineering at the University of Alberta. Dr. Al-Hussein says modular construction has many other advantages. First, the crew is working indoors to manufacture building components in a temperature-controlled and safer work environment. Second, the builder can more easily predict the time it will take to construct a building and the cost, and have greater control over the overall quality and consistency. Third, construction materials are protected from the elements prior to delivery to the job site. And finally, there is also a reduced environmental footprint with this approach, since less carbon dioxide is generated by the manufacturing and building process and there is less on-site waste. Steve Price, executive director for bioindustrial innovation at Alberta Innovates Bio Solutions (AI Bio), says he expects modular off-site construction will have an impact on both residential and commercial construction, as building codes are adjusted to allow for more wood use. However, Price says Alberta’s wood-product manufacturers should take note of the type of wood products that these builders are using, as it may require companies to adjust their product offerings to the building industry to maintain market share. Because precision is so critical when manufacturing modular components, some industry-leading modular home builders like Edmonton-based Landmark have chosen to use more predictable engineered wood products rather than standard dimension lumber as their primary building material. At present, about 80 per cent of their building material is laminated veneer lumber (LVL). Advances in technology over the past two decades have greatly improved off-site construction. For example, Landmark has invested about $15 million in a large factory in Edmonton featuring a significant amount of computerized planning tools and robotic building technology. The company takes away its waste in buckets—not truckloads—from its construction sites, Beyer adds. Dr. Al-Hussein says AI Bio’s support is essential in helping to advance knowledge and acceptance of modular off-site building construction practices. Because AI Bio also has strong connections to the primary wood-product manufacturing industry, it is playing an important role in helping to align research in building construction with research related to the forest sector. As modular construction advances, building designers have started to think of new and better materials that could be used, perhaps involving nanotechnologies and bioproducts. However, research is needed to ensure that these materials are safe and deliver good performance, and this is one area being investigated under Dr. Al-Hussein’s direction as the NSERC Industrial Research Chair in the Industrialization of Building Construction. AI Bio is also providing financial support for this chair. Results from test sites in Alberta show that implementing a rehabilitation design developed by the Canadian Wood Fibre Centre (CWFC) for mountain pine beetle infected stands with over 50 per cent mortality could deliver multiple benefits. “We have been able to capture some value from these sites, tentatively reduce the pest and fire risk, and enhance stands to put them back on a productive trajectory to meet future objectives of the forest industry,” says Derek Sidders, CWFC Prairie Regional Co-ordinator and Program Manager. With support from the Forest Resource Improvement Association of Alberta (FRIAA) Mountain Pine Beetle Rehabilitation Program, CWFC has partnered with Canfor, Spectrum Resources and University of Alberta researchers on an operational trial aimed at investigating the most effective way to recover value and rehabilitate beetle-affected small stem lodgepole pine mixed stands with over 50 per cent mortality. Forest companies avoid harvesting these sites because they have minimal conventional commercial value. However, left unchecked, they could have a significant impact on the future health and production of the commercial forest. Therefore, there is a need to develop an effective way to rehabilitate these sites. This development project is taking place on forest blocks totaling approximately 450 hectares north of Grande Prairie. A CWFC-designed rehabilitation system, involving innovative harvesting and regeneration methods, is being deployed. 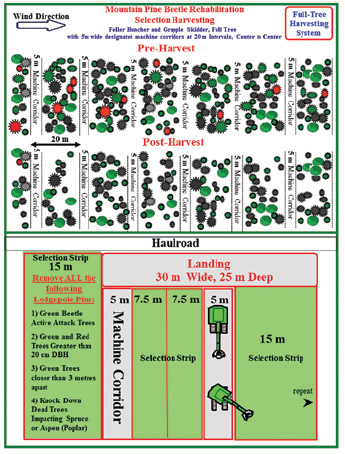 Sidders describes the harvest prescription as a full tree systematic harvesting pattern, using five metre wide parallel machine corridors centered at 20 metre intervals with landings servicing two to three machine corridors. Between each machine corridor is a 15 metre selection strip, which in total occupy about 75 per cent of the treatment area. Selection from within this area removes active attack trees, trees with commercial product potential and other stems impacting stand health and vigor. He adds that green active-attacked, red-impacted, and green lodgepole pine trees greater than 20 centimetres in diameter or in dense patches are being recovered from the retention strips. White spruce and aspen are only being harvested from within the machine corridors and will be sorted for sawlog, OSB or biomass production. If there are stands of dense, green, non-attacked lodgepole pine within the retention strips, the trees are spaced to about three metres between boles. The completed area, consisting of multiple development and research test sites, will be harvested by the end of March, with site prep and planting taking place this spring and summer. “We’ve found so far that the harvesting prescription is effective in meeting the objectives of the project and program and is reasonably easy to deploy operationally,” says Sidders. Once operator training on the unique pattern was completed, the feller bunchers harvested down the machine corridor and back out to the landing, creating bunches from the machine corridor and selected wood from the retention strips. All bunches face the landing and are accessible from the machine corridor. Skidders backed down the machine corridors and grabbed bunches of green, red, and grey lodgepole pine, white spruce and aspen, sorting them into various decks at the landing. The material is then processed, based on the demand for the various products. The biomass gathered from these sites is being mulched, chipped and compress-baled using a Gyro-Trac Biomass Baling System (BBS) unit, creating 700 to 1,000 kilogram bales for sale to the bioenergy or oil and gas sectors. “Throughout all these operations, time and motion studies are being completed by the CWFC, as well as very detailed time and motions studies on the biomass baler by FPInnovations,” says Sidders. The treated sites and landing areas are being site prepped for replanting using an excavator mounted mixing or mounding attachment to create suitable micro-sites. Sites will be replanted with white spruce and lodgepole pine. CWFC and University of Alberta researchers will monitor the research sites on an ongoing basis.